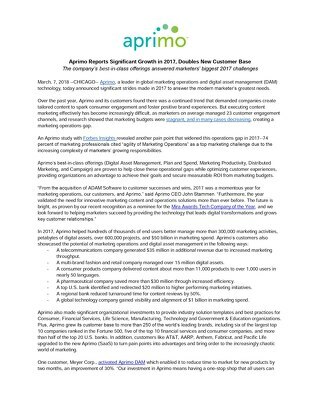 Aprimo, a global provider of marketing operations and digital asset management technology, announced the winners of its 2018 APEX [APrimo EXcellence] Awards at its annual Sync! conferences held separately in Chicago and London. 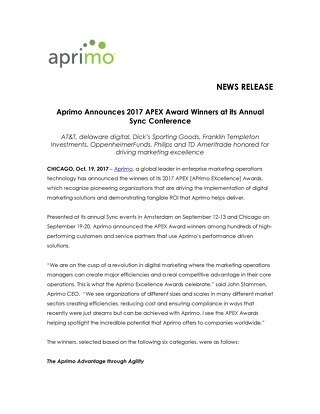 The awards recognize organizations that drive marketing excellence through the use of Aprimo solutions and demonstrate tangible ROI while achieving their digital transformation initiatives. 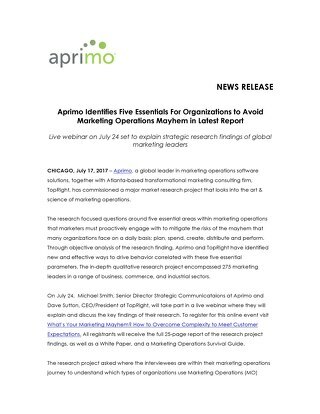 This year’s Aprimo Sync! 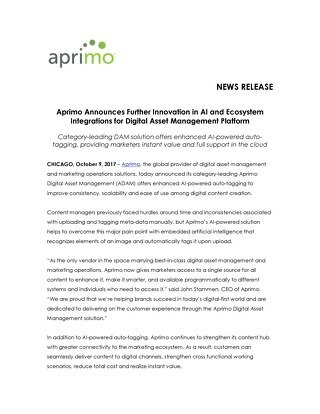 brought together hundreds of experts, customers and industry leaders focused on accelerating digital transformation in marketing. 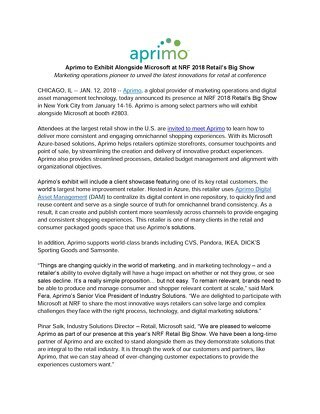 The two-day events encompassed discussion around the essentials of how to operationalize business and evolve marketing, spanning best practices around the use of marketing resource management and digital asset management to succeed in today’s digital- first world. 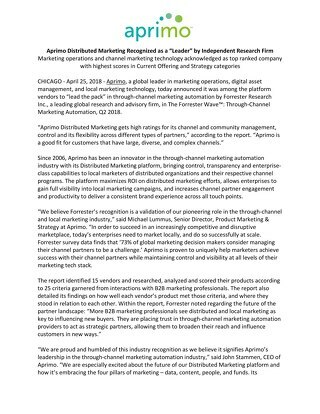 CenturyLink was recognized for its use of Distributed Marketing to scale processes to support more partners. 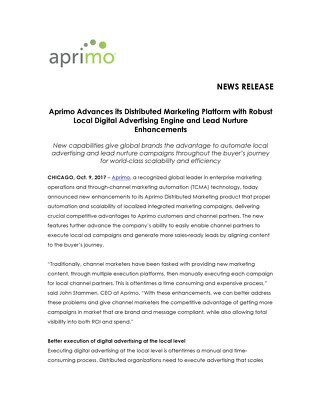 With Aprimo’s ability to scale in the form of automation and self-service, CenturyLink was able to allow more access and elevate marketing support for partners of all types and sizes. 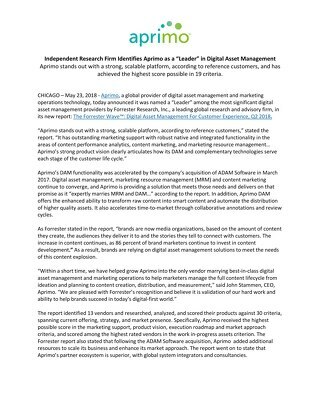 Sage was recognized for its use of Marketing Productivity, Plan & Spend, and Digital Asset Management. 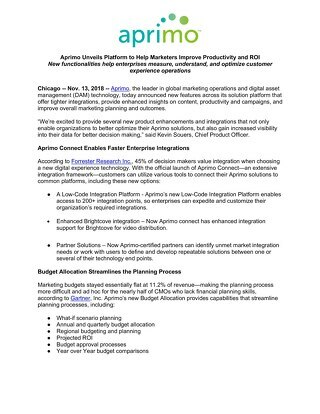 By working with Aprimo, Sage saved time and money by moving away from quarterly planning processes to more continual planning, along with consistency in the use of common fields, terminology and mindsets created when planning, reviewing and reporting for users. 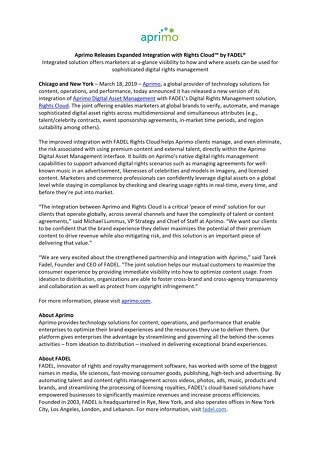 The Home Depot was recognized for its use of Digital Asset Management. 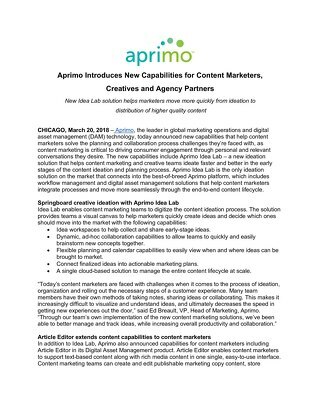 By working with Aprimo, it was able to create a single source of truth to securely store and access all media assets. 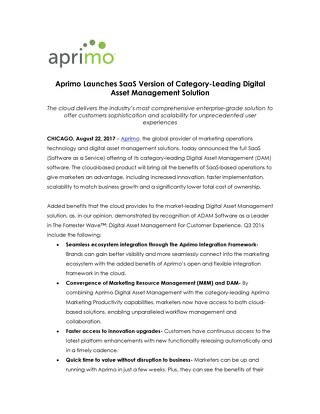 Now, The Home Depot is able to scale and onboard additional assets as companies are acquired, reducing any redundant agency cost for re-creating assets previously developed but not able to locate. 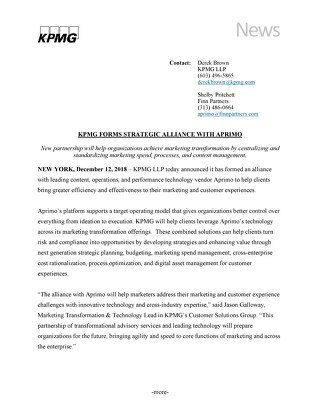 Accenture was selected as an Aprimo Alliance Partner of the year. 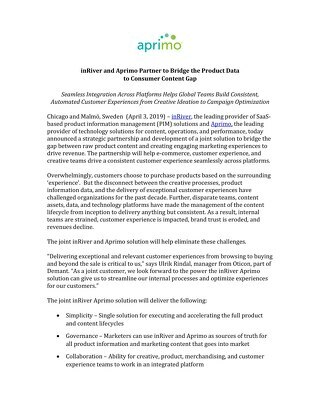 Accenture is leading one of the biggest deployments in the U.S. and has contributed to Aprimo’s momentum as an alliance partner. 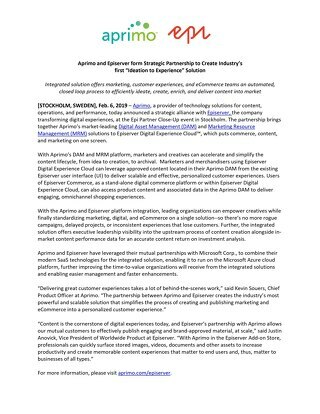 Delaware Digital also was recognized as an Alliance Partner for the second year in a row. 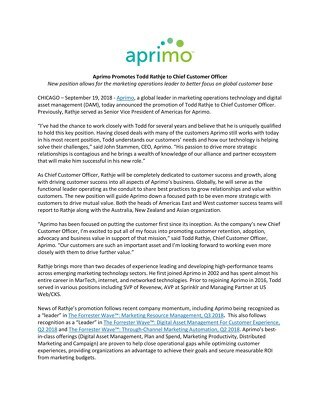 Throughout the transformation of ADAM to Aprimo, Delaware helped stay on top of the knowledge to drive better customer interest and adopt the new platform rapidly. 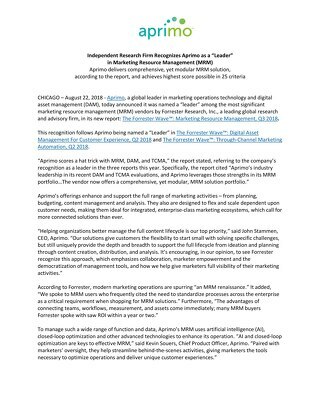 Delaware also was recognized for its mature approach to supporting implementations, especially with customers who were in the sales process at the cusp of the acquisition. 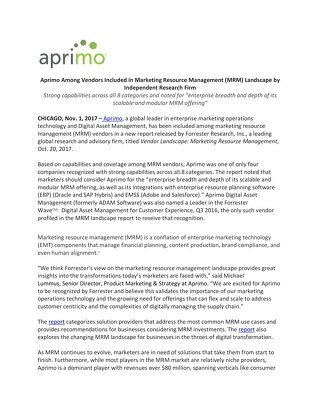 In addition, Dean Brown, Marketing Systems Manager, of Franklin Templeton was recognized as Aprimo’s MVP of the Year for his participation in reference activities with proven results using Aprimo solutions. 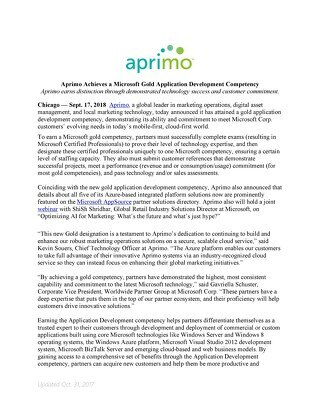 In addition, he was selected for being an advocate of the Aprimo company, people and solutions, as well as being a partner who shares the Aprimo values and executes on them. 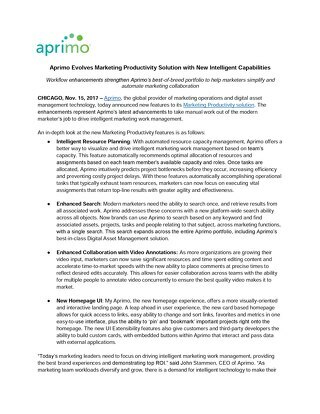 Aprimo’s largest Sync! 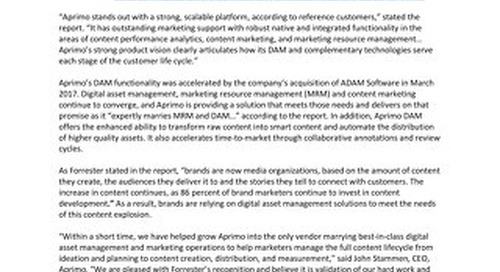 events to date follow recent significant company milestones. 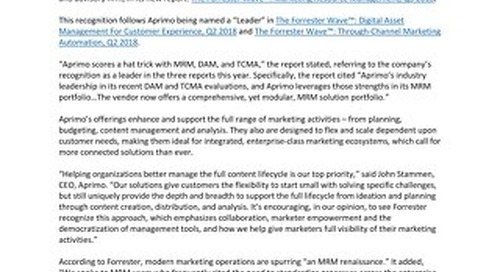 Just one year after the acquisition of ADAM Software, Aprimo was named a “Leader” among the most significant digital asset management providers by Forrester Research, Inc., a leading global research and advisory firm, in its new report: The Forrester WaveTM: Digital Asset Management For Customer Experience, Q2 2018.Plus, Aprimo was recently recognized among the platform vendors to “lead the pack” in through- channel marketing automation by Forrester Research in The Forrester WaveTM: Through-Channel Marketing Automation, Q2 2018.